Tatsuo Shimabuku, the founder of Isshinryu karate, was born in the village of Chan (nowadays: Kinaka, a part of Gushikawa city) on Okinawa, Japan at the 19th of September 1908. His parents were farmers and Tatsuo helped them since his youth at the farm. At his birth he first received a girls name. This was a Okinawan custom, adopted by the Chinese, to fool evils spirits who would be looking for a girl instead of a boy. After the evil spirits were fooled, the baby received the Okinawan name Kana and the Japanese name Shinkichi. The Japanese name Shinkichi can be found in Shimabuku’s koseki (= family register) and later on his passport. The Okinawans (since 1879 under Japanese government) gave two names to their children , because they were forced by Japan not to use any Chinese or typical Okinawan customs. One of the things they forbid is to wear the hair in a topknot, a custom used when a boy interred manhood. They were also told not to speak Okinawan hogen (dialect) but Japanese. Many Okinawans gave their children a Okinawan name, which couldn’t be used on their koseki (family register). At the age of twenty-three he married his wife Uto. From this marriage four children were born, in the following sequence: two daughters, Matsuko and Yukiko and two sons: Kichiro and Shinsho. Shimabuku named his two sons after himself: Kichiro and Shinsho; his name Shinkichi split in two parts. Only about his Thirty-ninth age he took the name Tatsuo (around the time he starts giving karate lessons). Tatsuo means in English ‘dragon man’. The dragon is on Okinawa a symbol of happiness and prosperity. His second daughter Yukiko married Angi Uezu, who shall be important too for Isshinryu later. His first born son Kichiro is nowadays the official heir of Tatsuo, but many people, including Arcenio J. Advincula, regard his second born son Shinsho as a better heir and only acknowleged tenth dan Isshinryu karate. At his thirteenth year Kana received his first karate training with his uncle Ganeku, who also lived in the village of Chan. Ganeku mainly learned him Chinese philosophy and literature, like the ‘I’Ching’ and astrology, and a little karate. According to Shinsho Shimabuku (Tatsuo’s second born son) Ganeku stayed two years in Fuzhou, China, where he learned fortune telling (sumuchi) and Shorinji kempo. Because Shimabuku’s uncle had to little knowledge of karate, he later introduced him to Chotoku Kyan, who lived in Kadena. This became his first teacher of three very famous karate teachers he trained with: Chotoku Kyan, Chojun Miyagi and Choki Motobu. Chotoku Kyan Chotoku Kyan (1870-1945) was a student of master Yasutsune ‘Ankoh’ Itosu, who taught him Shuri-te, and of master Kosaku Matsumora, who taught Tomari-te. These two styles were combined to Shorin-ryu (named after the Shaolin temple tradition). Chotoku Kyan is one of the most famous Shorin-ryu teachers. Kyan was a perfectionist and Shimabuku became one of his best students. Around 1931/32, Shimabuku was about 23 or 24 years old, he walked barefoot to Kadena where Kyan lived. He trained six hours a day and after arrival home he helped his parents on the farm. Kyan was a traditional teacher and taught as first kata Seisan and not the beginner kata which his teacher Itosu since 1904 had introduced on the Okinawa schools. Karate is a martial art and not meant for children. Shimabuku trained for four years with Chotoku Kyan and learned from him the following kata: Seisan, Naihanchi, Wansu, Chinto, Kusanku, a sai kata: Kyan no Sai and the bo kata Tokumine no Kun. Chojun Miyagi (1888-1953) was the top student of Naha-te grandmaster Kanryo Higaonna. Higaonna formed Naha-te by combining Okinawa karate with Chinese kempo (Chu’an Fa / Kung Fu). Miyagi, like his teacher, went to China to study kempo. Back on Okinawa he formed his own style of karate, which he later called Goju-ryu (hard / soft style). Goju Ryu is taken out of a line of the book Bubishi (eight precepts of Chu’an Fa). Chojun Miyagi with students Since 1936 Shimabuku received lessons from Miyagi. Miyagi lived in Naha, which was much further than Kadena. Also this much longer distance Shimabuku walked. With Miyagi he trained for three years. Miyagi was known for his powerful grips and power training. From him learned the kata Seiunchin and Sanchin. The next teacher became Choki Motobu (1871-1944). Motobu was a less formal teacher then his former teachers. This famous Shorin-ryu teacher was also known as someone who practiced his techniques in street fights. Motobu became famous in the twenties in Japan, as he picked op a bout with a price boxer who challenged the public to fight with him. Motobu, already in his fifties, took the challenge and eleminated the boxer with a knock-out. About this happening the Japanese news papers wrote articles and Motobu became instantly (with one strike!) a famous karateka in Japan. makiwara Tatsuo trained in 1938 for about a year with Choki Motobu, who lived in Naha, just like Miyagi. 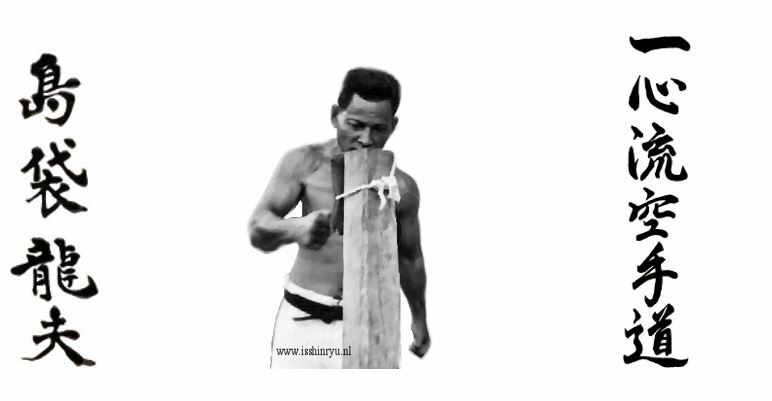 Motobu stressed the importance of Makiwara ( = punching board ) – training. Shimabuku’s most important lessons were the practical applications from karate (street fighting techniques) and Motobu’s version of Naihanchi kata. In 1939 Shimabuku traveled to the Philippines, he stayed there for two years. According to Shinsho Shimabuku (Tatsuo’s second born son) his father gave on the Philippines karate lessons to a theater group. Prior before Japan gets involved in world war 2, in 1941, he went to Osaka where he worked as a general supervisor until 1944. At that time Shimabuku went back to Okinawa to get his family and take them to Kyushu, Japan, to protect them against the war. Since than he earned his living as a farmer. One year after the ‘Battle for Okinawa’ (1945), he brings his family back to Okinawa. From age 39 Tatsuo starts giving karate lessons. According to Shinsho in the following dojo: Konbu Dojo in Tengan (1946), Tairagawa Dojo (1947) and Chan Dojo (1948). At that time he called his style Chan Migwa karate, after Chotoku Kyan’s nickname (Chan Migwa = small-eyed Kyan in Okinawa hogen; Kyan wore glasses). After 1951 he called his karate style Sun nu su karate after the nickname he received from the mayor of Chan. In Tatsuo’s family there was a dance called Sun nu su, which means ‘son of old man’. Later Shimabuku shortened Sun nu su to Sunsu, also the name of the kata he created: Sunsu kata. At a special gathering with his students held at January 15, 1956 he declared that his style of karate should be called: Isshinryu karate. Isshinryu means: one-heart or one-mind method. Eiko Kaneshi, Tatsuo’s right hand man said: “Why Isshinryu, why such a funny name?”, and Shimabuku replied: “Because all things begin with one”. Isshinryu stems from three different martial arts. One of the interpretations of the three stars in the Isshinryu emblem, the Megami / Mizu Gami (which has been designed with Tatsuo Shimabuku’s approval in 1961 by Arcenio J. Advincula), is that they stand for Shorin-ryu, Goju-ryu and Kobudo. Tatsuo Shimabuku once said that Shorin-ryu’s naihanchi the mother, Goju-ryu’s sanchin the father and the result Isshinryu was. Shimabuku analyzed and perfectioned all kata, techniques and applications he learned from his diverse teachers. He took what he regarded the best and most effective out of Shorin-ryu, Goju-ryu and Kobudo and together formed that into a new system. Shimabuku had developed a karate system with fast, direct and powerful punches and kicks, without every superfluous movement. He replaced the traditional twisted punch with the trademark of Isshinryu karate: the vertical punch. A punch with a vertical fist is faster and has more impact. In a real fight the – in many other styles learned – horizontal fist is most of the times replaced with the more effective and faster vertical fist (as you also can see in a boxing match). Agena Dojo Tatsuo instructed the people of Okinawa and also many American soldiers, who were stationed on Okinawa after the war. In 1956 he starts to use the Agena dojo, giving him the opportunity to be nearer to the American bases. From the American marines he got a contract for $250 a month (which was much money that time) to train the Americans. Because of that Shimabuku became one of the first professional karate teachers. Many American marines, who had trained with Shimabuku, brought Isshinryu karate over the ocean and were important for Isshinryu karate’s growth and popularity worldwide. In 1960 the first international Isshinryu association was founded; first called Okinawan American Isshinryu Association (OAKA) and later changed to American Okinawan Karate Association (AOKA). The founders of the AOKA were: Tatsuo Shimabuku, Harold Mitchum, Kinjo Chinsaku, Ralph Bove, William Blond and Steve Armstrong. Later also Don Nagle and Harold Long shared the AOKA. It’s a pity that in the following years many international organizations were founded. This happened because of disagreement or contradictionary interests. Some of these organizations are: IWKA, OIKKA, IIKA, UIKA en UIC. Anyway: their shared interest is promoting Isshinryu karate! The official Dutch organization is the NIKA, which was founded in 1986 by Steve Armstrong and Fred van de Vijver. Tatsuo Shimabuku Tatsuo Shimabuku twice visited the U.S.A.: 1964 and 1966. In 1966 a film was made of Shimabuku’s executions of the Isshinryu kata. At this visit he promoted Steve Armstrong, Don Nagle and Harold Long to 8th dan. Harold Mitchum already was promoted to 8th dan before. In 1971 Shimabuku stopped teaching karate and kobudo, but still promoted students and did some dojo functions. On the 30th of May 1975 Tatsuo Shimabuku died of stroke. Let us remember him and honour him with good Isshinryu karate!